APPEARANCE: Hazy and beautiful coloring…somewhere between orange and raspberry red. HEAD: Nice, foamy, off-white head. Fades slowly. LACING: Sporadic, but VERY sticky. Once it was laid down, it stuck to the glass like concrete. 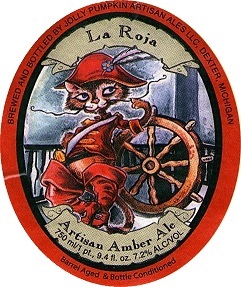 NOSE: Full disclosure…I actually thought La Roja was a Dubbel for some reason (I’m an idiot). BA has it listed as a Wild Ale, but it smells and tastes, for all the world, like a Flemish Sour. There’s a subtle and sweet aroma of candy apple that serves as the foundation. On top of that is a sharp, sour cherry tang. And punctuating everything like a jazz flute is the bold aroma of funky, musty, wild yeast. TASTE: The La Roja has a somewhat jarring taste. The nose is bold and upon first sip, it seems like that aggressive aroma will be well-matched by the taste. Instead there’s an initial flavor of sweetness and burnt sugar which is quickly washed away by a muted sourness and a dry, earthy finish. You rarely find a beer with such a disparity between the nose and the taste in terms of “power”. I don’t necessarily think it’s a bad thing…just a bit disconcerting. DRINKABILITY: I enjoy sour beers so I found the La Roja to be quite drinkable. The Prof and I had no problem crushing the bomber we were served. Still, I doubt we would have rushed to order another. I like Jolly Pumpkin a lot, but this wasn’t my favorite. The Oro de Calabaza is still their most sessiony brew. Posted in Tasting Notes.Tagged Ann Arbor, Jolly Pumpkin, La Roja, Wild Ale. I thought this was a pretty good beer — I’m only just getting into the sour style, but thought it was quite drinkable. Agreed though, now that I’ve tried this one I’d be more likely to try one of Jolly Pumpkins’ other brews. As you know, I’m partial to Belgian style beers, something they’re more well known for anyway. The owner of Jolly Pumpkin, Ron Jeffries is quoted a few times in Brew Like a Monk for his insights on the American brewing industry and Belgian beers.